This post is the first instalment in a four-part series. 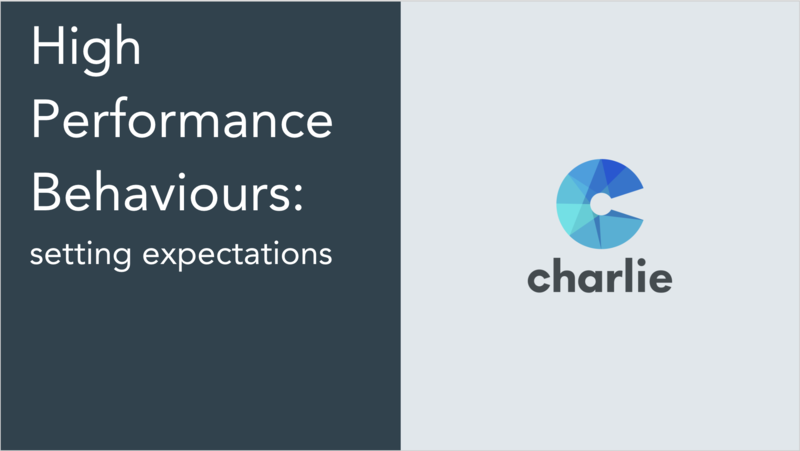 Over the course of that series, Charlie CEO Rob O'Donovan reflects on how he and his team totally transformed the way they work - and on their journey to create a genuine culture of high performance. This is the story of the hardest business lesson we've ever had to face up to. It's an incredibly difficult one to write about... but it's also been one of the most valuable learning curves for myself as a founder. But it wasn't a journey I took on alone. Throughout this series, you'll hear regular input from members of our team - as this journey was as much about them as it was about the founders. We care deeply about how small companies achieve their potential. The key to their success lies in unlocking the best in their talent; creating the environment for their people to do exceptional work. Charlie is a small company too, and while we're constantly thinking about how we can build a great place to work, we are - of course - still learning. We make mistakes. And when we do, we want to share them in the hope that our community can learn from where we went wrong. "I just don't see the urgency"
Earlier this year, one of our investors camped in our office for the best part of a month. He was helping with our growth strategy while getting to know our team and business more intimately. In the process, he became both an incredibly useful sounding board and a great friend of the company. When it was time for him to leave, he took Ben (my co-founder) and I for breakfast at a cafe not far from our Old Street office. He was extremely complimentary of the people on our team. He praised the mutual trust that fostered a true sense of collaboration and our candid approach to feedback. He felt the passion we had for the problem we were solving and praised our product. "Overall, and I don't know a nice way to say this, I just don't see the urgency. It feels like a 10-5 culture, interrupted by lunches and coffees. Our best teams work like crazy." My heart sank deep into the floor beneath me. We always pride ourselves on how we relish feedback, but it’s extremely difficult to handle being told that you’re just not pulling your weight. Worse still, we instantly knew that he was right. It was embarrassing that somebody outside the company had recognised it before we had done anything about it. As we reflected together over the hours that followed we realised we had fallen foul of a far bigger error. We had obsessed - as we often do - on building a culture where our team loved to come to work, rather than one that encouraged them to deliver their very best. We had failed to realise that creating an environment full of trust, support and mutual respect is important, but not the finished article. To really achieve maximum results, we had to push our people hard so they were constantly out of their comfort zone. What's more, of course, is we felt that they deserved that. Our team are ambitious. They want to learn and grow quickly. By not pushing them we felt like we were letting them down as well. And they knew it too. Fortunately, my co-founder Ben is a culture-building wizard. He has an inimitable knack for understanding how to mould culture to the needs of a company along with the empathy to carry the team with him. We set him to work on solving the challenge. That meant things were going to get harder. More uncomfortable, more stressful, and more demanding. It wasn’t about reversing many of the cultural foundations we had built - in fact, as we’ll review later, the culture we had already created was one of the key reasons we could make progress quickly - but we had to layer something entirely new on top. We had to understand what that was and how to bake it into the business. Fast. What does “high performance” look like? We had multiple discussions… with the team, with advisors, with other founders, with customers. Who are your best people? What makes them that way? What are their common attributes? Almost always the conversation revolved around characteristics -“team player”, “fast thinker”, “self-motivated” - all labels that recognise a trait but aren’t particularly informative. It’s not very helpful to tell someone they need to be a “team player”. We needed to tell them what a team player does. What a team player looks like. How a team player behaves. That would enable us to be really clear in our explanations of what individuals needed to change and how. Behaviours set clear expectations that everyone can aspire to, evaluate and feedback on with consistency and certainty. Another challenge, of course, was the immediate potential of falling into a culture of presenteeism. Our conversations with others heralded the long-established notion that high performers worked longer hours, or at least that the latter is an indicator of the former. We remained adamant this was a fallacy and to us, it was paramount that we didn’t fall into that trap. We focussed on the short term. Understanding that we needed to make an impact fast, we asked ourselves what we needed to achieve over the next quarter to make progress. This wasn’t about striving for perfection - nor finding catchy slogans that would forever be emblazoned in big bold letters on our walls - but moving forward in the right direction quickly. Our mission was to create immediate results and discernible momentum. We focussed on the specifics of our team. We didn’t aim to identify the universal set of behaviours that would be present in any high performing company, but to address the key areas where we felt we were letting ourselves down. We were good at giving/receiving feedback, collaborating effectively and communicating well. But we decided we were weak - in relative terms - at creating energy across the business and focussing on speed, output and results. We found the descriptive elements to be extremely clarifying - it’s critical that everyone is on the same page, and taking the time to really describe what we all mean by each behaviour is a useful exercise, and the output of that is often referenced. We have reduced our behaviours from six to four over time - this gives us fewer to focus on at any one time and ensures each area is distinct. Coming up with a plan of action is one thing. Putting it into motion is something else entirely. Read the next post in this series to learn how Charlie rolled out this process across the entire company.